"Junie Beatrice Jones or "Junie B." as she is called for short, is an innocent, spirited five- to six-year-old American girl". So what ??? Because she is what I am reading these days, I mean "she" as in about her, books where she is the main character. You see Big Sis S's kindergarten teacher very happy with her reading skills offered to get her some books from her own childhood collection. Had it been my teacher from my childhood I would have carried home books about Mahatma Gandhi or Aesop's fables and made Mom happy. But of course S's teacher is not same and got her a "Junie B. Jones" instead. All was well, nice school story, the kind I was fond of, I thought, until S asked "what is pasketti?" That word sounded so wrong that I read the entire book in one go. Truth be told, it was funny. But the English, it was absurd. The book was strewn with words like "flied", "bestest", "runned" and so on and so forth. Apparently the little girl(the character Junie) being a kindergartner has not got her grammar right yet and so the book uses her kind of language. That is very well for a Mom my age but what does a kindergartner reading such English do ? I had to constantly tell S all the verbs that were wrong in the book to not mess her up. This series is a very popular kid's series and I really have no clue why they would use wrong English if it is meant for an age group whose language needs to be enriched. Trying to be "the cool" Mom, who doesn't care for such frivolities I haven't told S's teacher about my concerns and so she has given S 2 more from the series. Couple of days back S shyly told D that Junie B. has a boyfriend. The Dad panicked, I could see it on his face. He was imagining boys, tattoo on their fore arm and misshapen shorts rising low on the hips, knocking his door. And then he told her what my Ma used to tell me at 15. He said "That must be just a boy who is a friend, like you have R & A and T in your class". Smirk, smirk. I am desperately trying to be "the cool" Mom here but honestly why does a kindergartner need a boyfriend and a current as well as an ex and also why do phrases like this "new Thelma (a naïve girl whom Junie B. 's boyfriend Ricardo always chases)" have to be in a children's book. Maybe I will just be un-cool and give S's teacher a "Suitable Boy" instead. Books which S can read and I have liked so far are The Magic Tree House and The Rainbow Fairies(Thanks Chox). Any more suggestions for 5-7 year old readers ? And now to the Ilish Bhaape or Bhapa Ilish aka Steamed Hilsa. 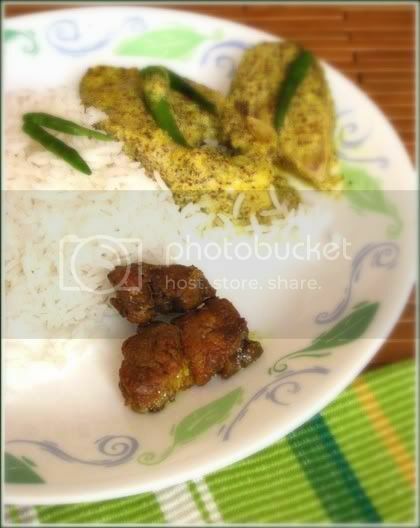 The dish I had talked about in my earlier post, the signature Bengali Ilish dish which has to be on all important menus when Ilish is in season. 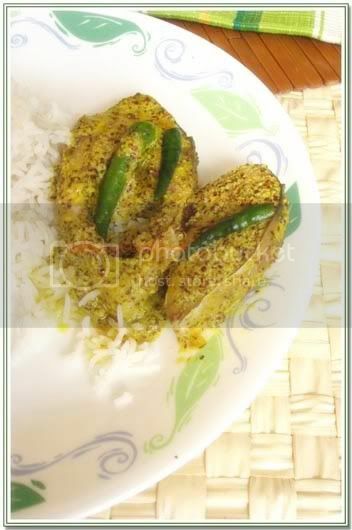 Hilsa steeped in a pungent mustard sauce steamed to perfection with a liberal dousing of mustard oil is a sensuous experience. There are two ways of doing this, actually 3, in the pressure cooker like my Mom, in a steamer and in the oven. I usually don't do this if I don't get Ilish which hasn't been frozen too long which is rare. It tastes best with fresh Hilsa. The oven version of this recipe goes very well with salmon too. Also I heard Herring tastes close to Hilsa so you can try this recipe with salmon or Herring if you don't get Ilish/Hilsa. Shad fish in North America has a taste close to Hilsa too. The fish roe(macher dim) is a delicacy enjoyed by the Bongs and Hilsa roe is much coveted. This time around I mixed Hilsa roe with little chickpea flour and green chili and then fried them in mustard oil. Make Sorshe Bata or Mustard paste. Grind the above with little salt to make a thick mustard paste or shorshe bata Note: Some of my friends do not use Posto or Poppy seeds for the paste. Instead they add a little grated coconut. In a bowl add the above mustard paste + 1 heaped tsp Yogurt + 2 tsp Mustard Oil + 1/4 tsp Turmeric powder + 1/4 tsp Red Chili Powder(optional) + salt to taste. Mix well. This is the mustard sauce you will use for the fish.Quick Tip: If you have a bottle of Kasundi, add 1-2 tsp of Kasundi to the mustard paste that you have made. This lends an awesome taste. Wash and clean 5-6 pieces of Hilsa/Ilish cut in steak size pieces. Serve hot with rice. Does not taste that great if stored and served later. Cook in pressure cooker for 2-3 whistles. Here is a pressure cooker version. Heaven! Bhapa ilish ar ektu shada bhat ... amar ar kichu chai na. :-)Ekhane toh brishti e shuru holo na ... kobe je ilish pabo ke jane. Amar E.Blyton er lekha borabor bhalo legeche ... like the golliwogs, noddy etc. ... tobe oto choto bacchader jonne likheche ki na jani na. Other good books for kids 5-7 are Magic School Bus and A to Z mysteries. Enid Blyton was a favorite of mine too. Sadly none of her books are found here. I don't know the reason, but she is not even known in this country. My Ma got some of the Noddy series for S though. Yours is a good method too, the steamer method right ? Hi BM, we've chatted before and I'll say it again, I lurvvve your food pix. I agree, a lot of kids' books today aim to be 'hep' and 'with it' by talking about stuff that isn't always appropriate. However, I've found enough 'safe' reading for my daughter. .. Enid Blyton is still the most popular (with reason too). My daughter and I love AA Milne's poems and prose, Dahl, Lewis Carroll and Seuss. And if you are reading to her, try Eva Ibbotson and RK Narayan's Swami and friends..good English, great stories that don't dumb kids down, and lots of opportunity to try weird accents, if you go for that sort of stuff. sorry for rambling, I get like this around book talk. If I am right you are Imp's Mom right ? I have not read Milne or Eva Ibboston, shall check them out. Enid Blyton I loved but as I said not available in the US. We have 4 from Noddy series though. Woww...now I got to go buy some Ilish! You are influencing me a lot :). BTW, I tried wet grinding posto in a magic bullet, and it didn't do very well, but I suspect the quantity might have been less. Do you usually do a large amount of mustard or posto. BTW, I hear that they restrict fish in US during pregnancy; as a bong how did you cope with it ? Ha ha...Li'l S is so sweeet, and glad to know she is doing so well in the reading department. Your description of the boyfriend cracked me up! :) I found used EB books online but they were so expensive. I had the same problems with Junie. B when DD started reading them. For the English it didn't scar her and the boyfriend I don't think it even registered. Enid Blyton I hear/read is banned in the UK. I might be wrong here but I am going to look for them all the same. We leave tomorrow. A series of unfortunate events more for a second/third grader but sometimes even a firtst grader might enjoy them. I have heard about this fish but never ever have tasted them, looks delish. I do not like junie B! My DD read most of them, but she could & can make out the wrong grammar for when i corrected her she said "mama she (Junie) does not know", so apparently DD knew. She does not care about Boy friends. so for she HATES boys. Magic School Bus is good. I got the Enid B books here in the library, but when i had asked for them no body seemed to have heard. they did do a search, & found some of them in another library & made a called. she liked the naughty amelia jane series. the reason they are not aware of EB is becoz EB is "BRITISH" - that's what i was told!! i also made her read the easy version of Little Women, Ann of Green Gables. Some of the lists in the library are great. macher dim ta last er jonne rakhlam.. sandeepa jib diye ar chockh diye jol porchey:-( monay pore na last kobe kheyechi.. ilish maach o tai. since no body else eats at home, i do not get that big one since it takes me a LONG time to finish it. ami tiffin box e seal kore pressure steam kori...& posto r jayega te narkol di. That's right. Its a steamer method. We have a pressure pan so no container :( Are pressure cookers used in America? Can't you get Enid Blyton off Amazon? I hear you about the grammar - had the same apprehensions when someone gifted a similar kind of book where all the words are turned around - like malapropism - very funny for me but was wondering whether it would confuse my 4 year old. But she "got" the humour of the book and figured it was all wrong...but the boyfriend part I agree is not quite necessary! Then there are many books by Tulika publishers which are beautiful Indian stories by new writers. And about the Ilish - its my favourite dish when we go to Oh Calcutta! - a beautiful Bong restaurant behind our house....but your dish looks so delicious!! I did not read the recipe as I am not a fish eater but the book got me intrigued. Isn't it wrong to start with 'butler English'? I stuck to noddy and later to Brer Rabbit, Five O'Clock tales etc. The whole series of Bubbles, Ladybird Books such as the Topsy and Tim series and Pooh's stories make good read. I had also purchased Poldy books and Childcraft which were excellent!! This bhapa ilish looks wonderful...had it once at a lovely bengali restaurant in bangalore and loved it...the book you are talking about it - why would they d something like wrong english in a book for the ones reading to learn...very wierd !! I think it is meant for 2nd graders and above, at least that is the conclusion I have reached. But even then correct english would have helped. Some favorites from my childhood are Understood Betsy by Dorothy Canfield Fisher, and Caddie Woodlawn by Carol Ryrie Brink. Also the Little House series by Laura Ingalls Wilder (it begins with Little House in the Big Woods) is wonderful. I loved Enid Blyton too, especially the Faraway Tree series (I guess we got them on sabbatical in the UK), but the ones I mentioned before should be easy to find in the US - and they are all well written books with good grammar and no boyfriends. :-) For poems, there are also the Flower Fairy books by Cicily Mary Barker, and of course Robert Louis Stevenson's A Child's Garden of Verses - beautiful. I also remember a collection of fairy tales I liked called Clever Gretchen by Alison Lurie, with smart and spunky heroines. PS. I also loved The Borrowers by Mary Norton. "Herring tastes close to Hilsa so you can try this recipe with salmon or Herring if you don't get Ilish/Hilsa. Shad fish in North America has a taste close to Hilsa too"
Herring, American Shad (East coast of US)and Hilasa (Pulasa or Polasa in Telugu, Modenn or Palva(Gujrat) all belongs to Fish Family:Clupeidae though differs at genus and species level . Now you know the secret of SIMILAR TASTE. Besides Bengladesh rivers, Hilsa also ofund in Narmada in Gujrat and Sindh Province in Pakistan. In India, Ganges,Godavari and Rupnarayan(kolaghatar Ilish)river varities are considered very tasty breeds. Both Salmon (family: Salmonidae) and Hilsa are are ANADROMOUS: they are born in fresh water, migrate to the ocean, then return to fresh water to reproduce. Sandeepa, I used to love Enid Blyton as a child. SO whenever I go to India I get a few books back with me hoping my daughter will enjoy them the same way I did. However, I recently met a 9 year old here who said she did not like EB as she could not identify with the stories!?? Anyway still hoping my daighter will read the books I have already collected for her. My Mom got some Noddy books for S. She didn't enjoy them too much I felt though she read all. But even we could never identify with EB books, that was a different life, loved them nonetheless. BongMom, we have bought Enid Blyton books (the Faraway Tree series and also the Five Find Outers Series) over Amazon. You do have to pay some extra shipping though. yea, This is really a fascinating blog, lots of stuff that I can get into. One thing I just want to say is that your Blog is so perfect…thanks !!!! Made it with Salmon tonight!! Turned out to be the most tasty Salmon dish I have tasted! Thank you. Love your blog- have been following it for a year! we were using Cookme's mustard paste for my shorshe salmon (regular feast in our home- UK)- it was heavenly but only available from India. I would get 30 packets and more everytime I visited home. Now they have stopped making it and we were distraught. So we have been experimenting with home-made mustard paste- your recipe sounds perfect. I will be using this the next time I cook it. Cant wait!!!! Thank you for the recipe. I bought frozen hilsa.Do I have to de-freeze it before putting it in the oven? Wont it dry up if I use microwave? You need to defrost it totally and only then proceed with the recipe. Also you need to wash and remove scales of the fish. But why microwave. for cooking ? Hi Thanks for this recipe. Tried a baked fish for the first time and it came out almost very well. salmon cooked very soft and tender and curry also gelled with salmon taste. it was a bit pungent. 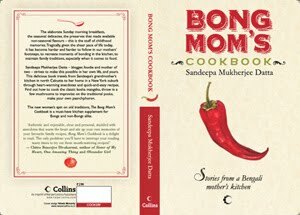 Being a north Indian and no exposure to fish cooking, it was a good help from your blog. Thanks once again. What brand of mustard oil do you use? I'm in the US. ei recipe ta bhetki fillet diye kora jabe? bhetki bhapa korte gele r kichu ingredients lagbe ki?